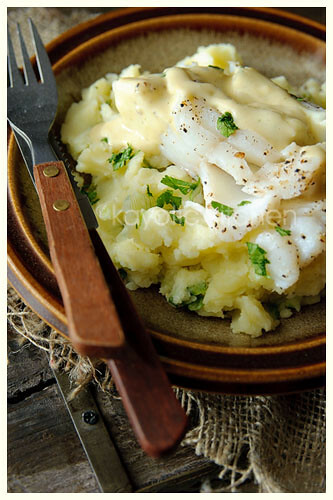 for Steamed Cod and Champ with Mustard Sauce. To say it looks delicious is an understatement! I like to steam fish. It’s one of the lightest and healthiest ways of cooking fish, but that’s not why it’s my preferred method: the fish holds its natural flavor when cooked like this. That’s a big plus to me. The mash is an Irish recipe called Champ. Mashed potatoes with butter and scallions that are lightly boiled in milk so the milk takes on the flavor. Crazy simple but so tasty. You could opt for Hollandaise or a light white sauce if you like. I’m going for a cream-based white sauce spiked with Dijon mustard. The mustard gives the sauce a wonderful edge. This is pure comfort food. A robust meal that fills you up and warms your soul. What more could you ask for? But the best thing about Kay's recipes is her photographs. She explains every step of the recipe visually with her brilliant photos as you see below . 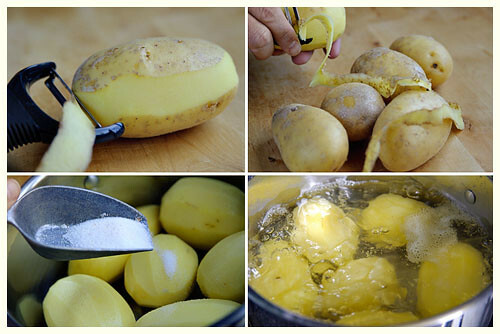 Peel the potatoes and boil them in lightly salted water until tender. This will take roughly 25 minutes. I suggest you visit Kays blog here to follow exactly how she makes this fantastic recipe. And when you've had a go, let me know what you think! and share it here today.